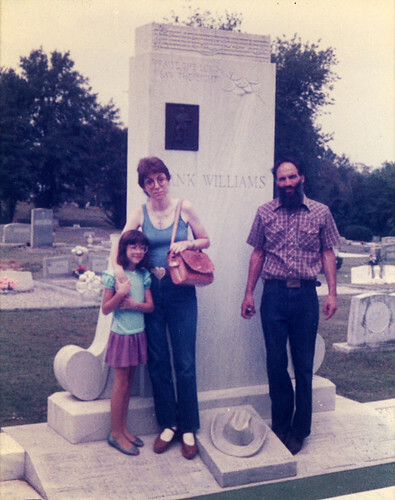 I don’t know if I understood that my mother was dying, or even what death really was. I knew she was sick, and I knew she wasn’t really available for most of the kind of mothering I so desperately wanted from her. I retreated into my world of books: on dinosaurs and Egypt, but I tried so hard to meet her on common ground – wanting to share her interests, her passions for art and music. She loved Hank Williams, and I did too, dancing around in the living room wildly to “Jambalaya” and “Settin’ the Woods on Fire”. I don’t think I understood that he was dead, that he had died nearly 30 years before I was born. I knew that he was sad, that he and his wife Audrey had fought and split up, but that he still loved her. I knew that he had died on a dark, icy road in the back of the Cadillac of drug and alcohol induced heart attack, on New Year’s Eve, 1953. It was my mother’s fifth birthday. 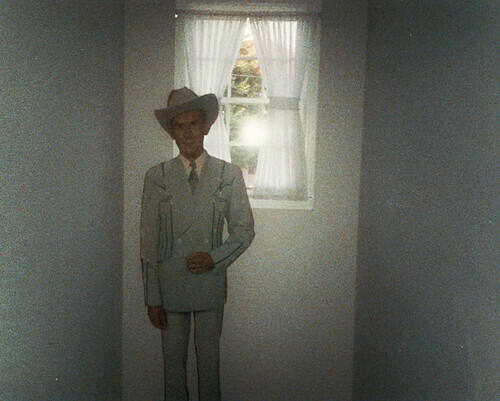 I knew that my mother loved him, was crazy about him (she even had a thing that went around her license plates that read, “Maggie’s Just Crazy About Hank Williams!”, but who was I to say that not everyone’s mom felt the same way about him? I knew women were crazy about Elvis, or the Beatles. I didn’t know what an obsession was. 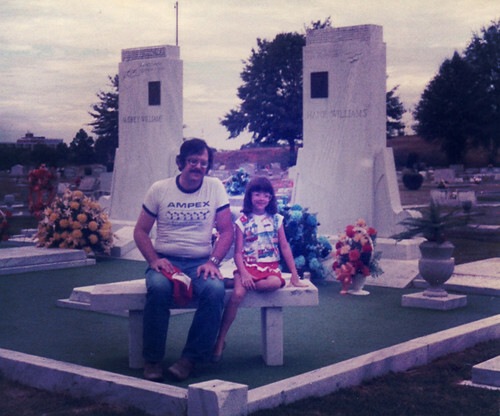 I didn’t know that my father and I were indulging the obsessions of a dying woman. I just thought we were on vacation. I think I thought of graveyards as parks where dead people slept. 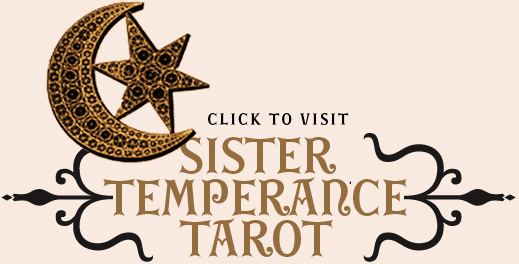 I suppose that’s exactly what they are, in a way. It’s no surprise, given my childhood, that I ended up being curious and fascinated by death and its rituals. 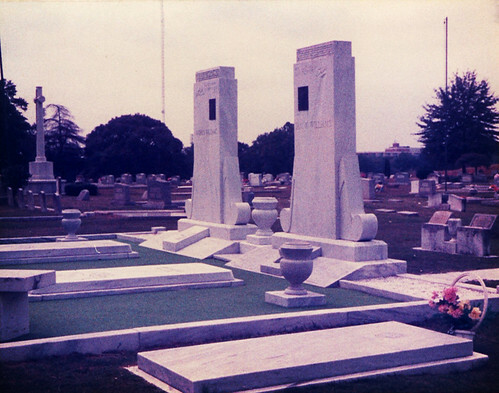 It was such a big part of my life, growing up in graveyards, running and playing between the tombs. I still find cemeteries peaceful, (though I no longer stage elaborate gothic photoshoots in them) and I am glad that I was raised to have an appreciation and reverence for the cities of the dead. Still, it’s strange to see these photos of us there, 27 years later. I am so tiny, and so awkward. I feel like even in these grainy photographs, you can see the pain writ large on my little face. 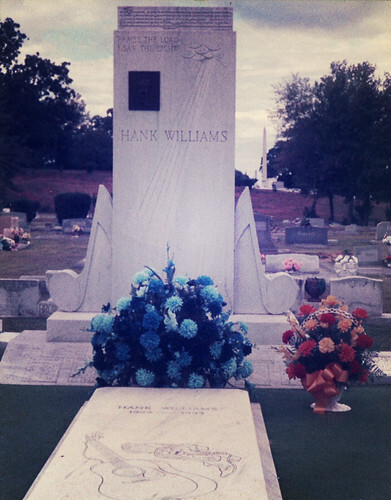 I clutch my mother’s hand with both of mine, and pose in front of Hank’s grave. She is so, so thin. Her hair cut short for chemo, her face drawn. You can tell she is so tired. We stand with Bruce Gidoll, her dear friend and Hank’s official historian. He lived out in Utah and raised wolves. My legs are so brown and my feet are so big in my favorite periwinkle pearl jellies. They made my toes smell like fritos. Makes me think of how you can tell how big a puppy will grow by looking at its outsize paws. I was like a gangly wolf-pup, huddling close to my dwindling pack. We came back again the next day, to celebrate his birthday. 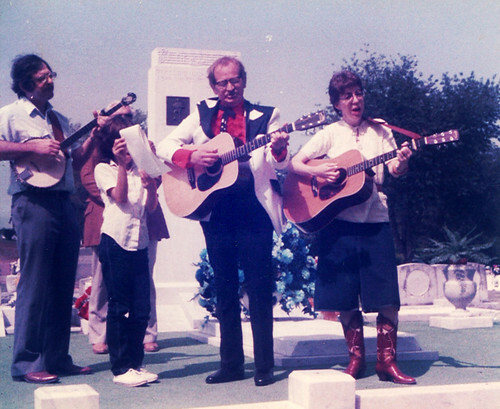 My parents played his songs, and people gathered around. in my hair and dressed my dolls in them. I didn’t know how morbid it was – I was just happy to have so many flowers. “I Saw the Light”, and “I’ll Never Get Out of This World Alive”, among others. 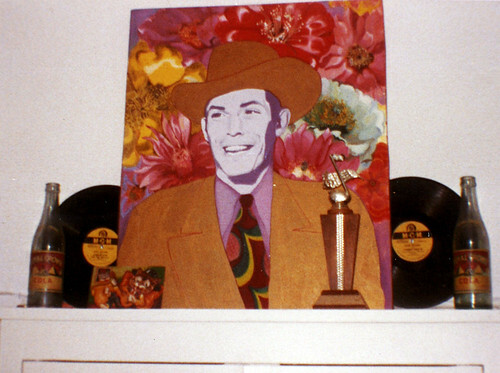 One of my mama’s paintings of Hank. A ghost. 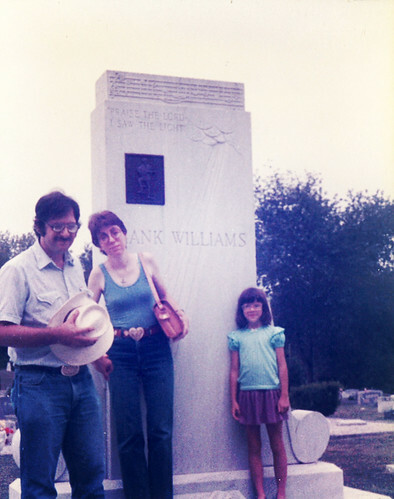 This photo was sent to my mom by Irene, Hank’s sister, who we got to meet on that trip. birthday, as well as my mother’s death day. She died in 1995. Happy birthday, Irene. Goodnight, mama. Goodnight, Hank. 5 comments • Tagged as: R.I.P. I love the photos of your mama playing music!!! I hope you frame them sometime….miss you and love you…..
OH MY GOD i just saw this post for the first time and it was like unearthing a box of treasure. and that photo! and caption! too much amazing. 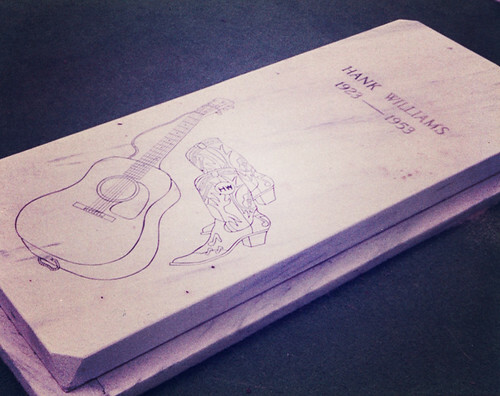 Bob dylan and Ramblin Jack Elliot were certainly around the hospital when Hank passed. 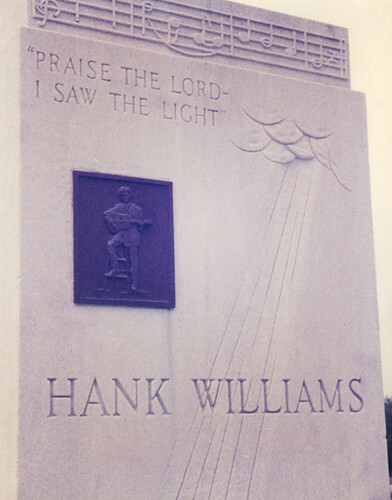 Hank sang alot about the labor movements struggles but never worked a day in his life! 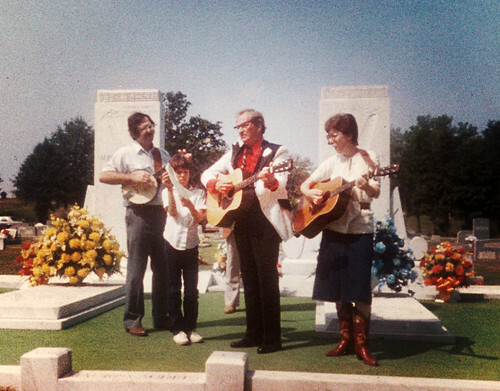 He truly lived the life of a ramblin musician. whoops i guess i was misinformed about where he finally died! Another beautiful painting of Hank! This is a sad but interesting story.